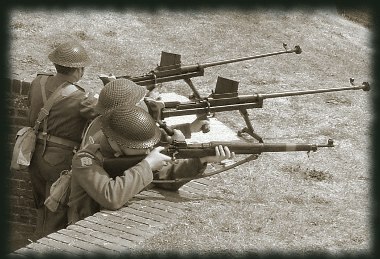 The 23rd Sussex Home Guard are a re-enactment group from the South Of England. The 23rd Sussex Home Guard have featured in Channel 4 Secret History series and Time team Their standards of accuracy in Home Guard uniform and equipment are unequalled in the re-enactment world. They are extremely proficient in WW2 arms and tactical drill as well as overall military procedure. The Platoon is equipped with P14, P17, Ross rifles, 12 Bore shotguns and Short Magazine Lee Enfield rifles. All in deactivated or live firing (blanks of course) state. 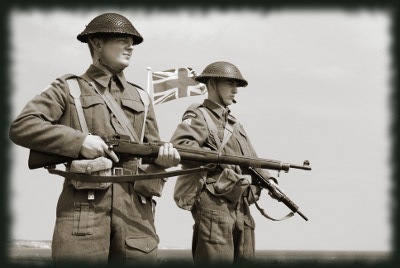 Support weapons are Boys Anti-Tank Rifle Mk.1, 303 Vickers Machine Gun, Bren Guns, Lewis Gun and Browning Automatic Rifle plus a complete range of sub machine guns as used by the Home Guard. Also available is a large selection of Home Guard memorabilia ranging from fighting knives and grenades to training equipment and clandestine weapons. There is a substantial archive of manuals, books, war office official documents and related ephemera containing the answers to many questions about the LDV and Home Guard. Apart from full scale living history displays the group is able to provide ‘show and tell’ displays and practical lectures covering almost every aspect of the Home Guard during WW2. They are also prepared to take on the role of technical advisers to film or television. The period most often required by the group to portray is 1942 to the Stand Down in late 1944 but they also have a complete range of civilian clothing and denim suits which enable them to depict the early wartime aspects of the L.D.V. and Home Guard.